Lindsey Pulliam looks for an open teammate. The freshman guard had 20 points in Thursday’s loss to Purdue. 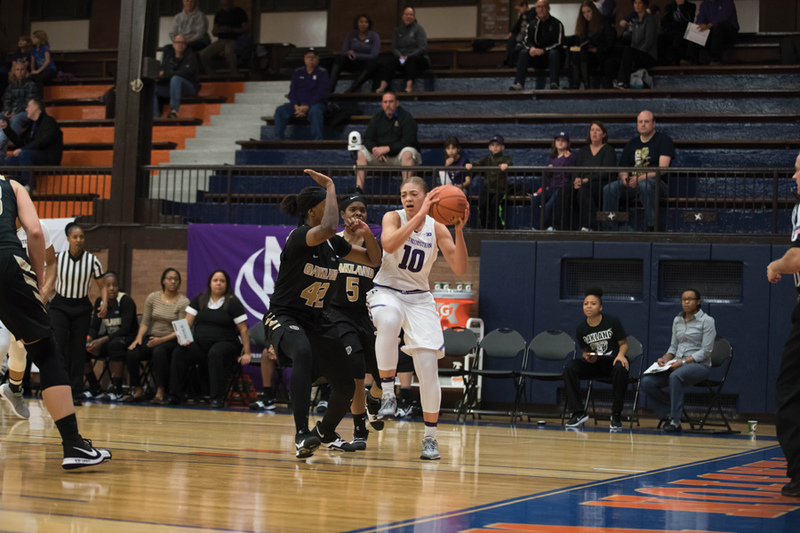 Trying to drive Northwestern to a .500 record in Big Ten play, Lindsey Pulliam was called upon for a full 40 minutes at Purdue on Thursday. Despite the miles she logged and the scoring responsibility she carried, the freshman guard nearly brought the Wildcats back from a 10-point fourth quarter deficit. When she hit a mid-range jumper with 33 seconds to go to reach 11 fourth-quarter points, the Boilermakers’ advantage was cut all the way down to 4. But after failing to force a turnover on the next possession, NU’s (9-11, 2-4 Big Ten) only opportunity to tie the game came on a half-court heave that Pulliam couldn’t get off before the buzzer sounded in the Cats’ 63-60 loss to Purdue (13-7, 4-2). Sophomore forward Abi Scheid was impressed seeing Pulliam, who finished with a team-high 20 points, continue to challenge the Boilermakers defense throughout the second half. Jordan Hamilton, NU’s other starting freshman guard, nearly played 40 minutes as well, despite battling foul trouble throughout the game. Coming off a career-high 22-point showing last week against Wisconsin, she played until she fouled out with under a second to go but finished with just 5 points. With senior guard Lydia Rohde out with an injury, all five starters played more than 33 minutes against Purdue. Sophomore guard Byrdy Galernik, who averaged more than 20 minutes per game, was left out of the rotation, while sophomore forward Abbie Wolf was the only bench player to play more than five minutes against the Boilermakers. Scheid, who played a season-high 39 minutes, led the Cats with four made 3-pointers and helped stretch the floor during Pulliam’s fourth quarter run. She finished with 18 points, but said the biggest change in the second half wasn’t her and Pulliam’s shots falling, it was their attitudes. NU held Purdue’s leading scorer, Andreona Keys, to just 4 points, and the Cats’ defense limited Purdue to 31 second-half points. The senior guard’s struggles, though, were alleviated by Dominique Oden, who finished with 26 points and was 5-for-5 from beyond the arc. Like NU, the Boilermakers relied heavily on their starters, playing four of them for 38 minutes or more. But against an opponent that just beat No. 18 Iowa, coach Joe McKeown said he wants to continue to see his team play with the purpose they did at the end to change the momentum of their season.